“Women’s Rights are Human Rights” —This picture was taken last Saturday in the small city of Oxford, Mississippi where an estimated 1,000 people participated in the Women’s March. I awoke Monday morning to see that one of Mississippi's state senators, Chris McDaniel, felt compelled to disgrace himself and his office, via social media, by openly insulting women. 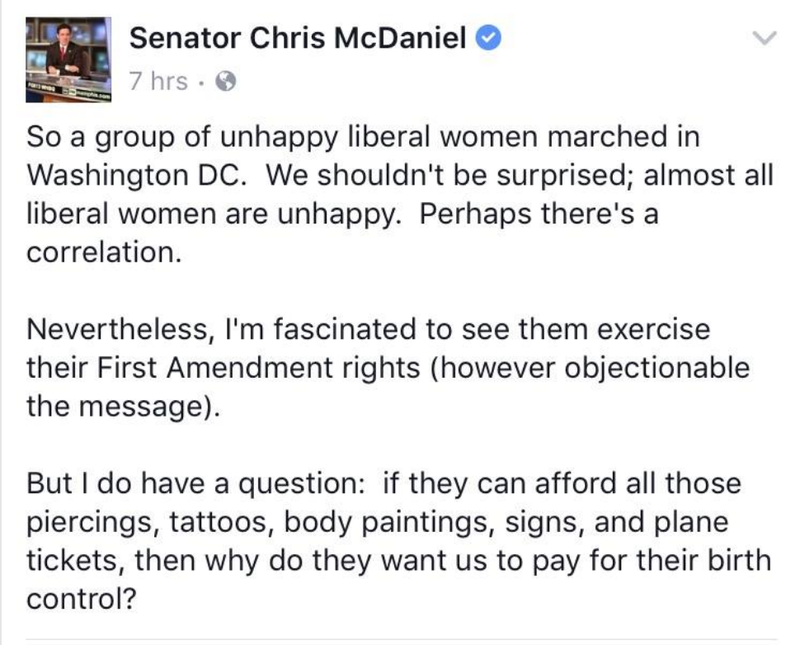 In response to last Saturday's Women's March, Senator McDaniel wrote a Facebook post calling the marchers "unhappy liberal women," disregarding the fact that this historic march housed an estimated three million men, women, and children, all from different political affiliations, nationalities, races, religions, and creeds, from across our state, country, and globe. All of them marching together for a number of causes, including--yes--women's rights. After disparaging "liberal women," the senator continued his rant by insulting women's bodies, mocking their financial priorities, and asking, "if [liberal women] can afford all those piercings, tattoos, body paintings, signs, and plane tickets, then why do they want us to pay for their birth control?" I mean, is this really where we find ourselves? As a Mississippian and "liberal woman," words are hard to come by in response to McDaniel's blatantly misogynistic attitude toward women and families who have come to depend on birth control as a basic part of women's reproductive health coverage. These words are especially discouraging considering Mississippi's acute need for quality women's health services, as our state continues to be among the highest regarding rates for teen pregnancy and infant mortality as well as lack of access for many Mississippi women to quality reproductive health services. But words must be found in the face of this kind of discrimination, especially when it comes from one of our own elected officials. I understand that leadership under President Trump, a man who openly bullies and belittles, gives confidence to others in leadership positions to disparage marginalized groups, publicly, with no repercussions. I understand that men such as Senator McDaniel view women as less than, and that as such, they feel powerful in throwing insults at the very people they are supposed to serve. 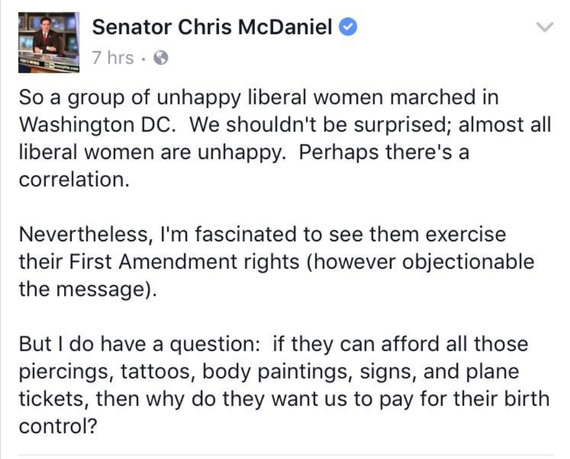 But I wonder, would Senator McDaniel say the same about men and women who bought bus tickets to march on Washington with Dr. Martin Luther King, Jr.? Would he criticize those suffragettes who bought train tickets to march for their right to vote? At what point did it become okay for elected officials to publicly mock American citizens for using their own resources to support causes close to their hearts? I understand that misogyny exists and that people in power often use intimidation to oppress those marginalized. But, y'all, we cannot stand for this rhetoric--in Mississippi or anywhere else. We must demand decency and civility from our political leaders--in their social media realms as well as other forms of public discourse. We must shun misogyny and recognize the importance of upholding women's rights at all costs. We must demand that leaders like Senator McDaniel, who found the message of the Women's March "objectionable," should reach out in civil conversation with their constituents. How different could this have been if the senator simply engaged in dialogue with participants of the marches across our state rather than using a social media forum to demean women and their desire for fair treatment? We must challenge Senator McDaniel's sentiment when he remarked facetiously that he found it "fascinating" that so many women would exercise their First Amendment rights. Women, and allies of women, I ask that we continue to fascinate those in power by joining together to fight the kind of bigotry exemplified in this senator's words and demand decency from those elected to serve us.